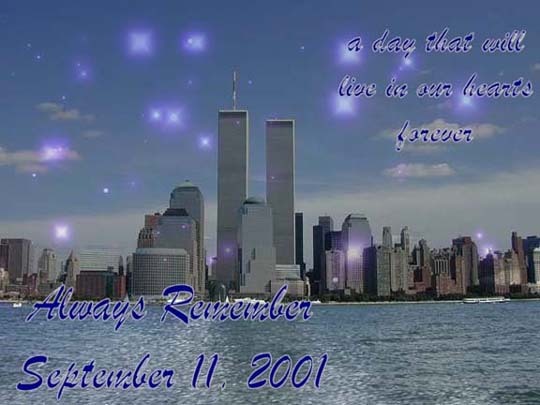 Shortly after the attacks on the World Trade Center and the Pentagon, lots of people e-mailed me, or posted online, to express their feelings about the events of September 11th and to encourage each other to fly flags or light candles to demonstrate the meaning of "united" in the name of our great country. These events have touched us all deeply, whether we know any victims personally or not, and they will probably affect us for the rest of our lives. We are truly a nation – a family – and united we stand. On the anniversary of these events, the hearts and minds of Americans are once again filled with memories and other thoughts – and overwhelming emotions – about the tragedy and its significance to all of us. No doubt, this will be the case for the remaining lifetimes of all who experienced it no matter how distant we may have been on the day of the devastation. 1. I learned that evil exists in my world. 2. I learned that good exists and it's stronger than evil. 3. I learned that life can change in a heartbeat. 4. I learned what a hero really is. 5. I learned that it's important to say "I love you" and to say "goodbye." 6. I learned that we all might possess courage. 7. I learned that I'm angry and, at times, scared, but that won't stop me. 8. I learned that I'm proud to be from Long Island and I'm prouder to be an American. And we of the Class of 1960 should likewise be proud of young Denise. Click here for a report of the memorial ceremony held in Oceanside September 11, 2002. One of the most poignant messages I received arrived only two days after the tragic attacks, and I am compelled to share with you below; it was from my dear friend for almost 50 years, our classmate, Nancy Keegan (Bixby). "Oh, Howie ― I'm sitting here with tears in my eyes. If I listen to or see any more of the carnage on the TV or the radio, I think I'll go insane. Everyone here is walking around like zombies. We all know someone who is missing. Families are just torn apart! I, personally, know of two who are missing. Numbness can't come quick enough, but even that doesn't quell the anger inside and the wish for justice. When the justice does come, AND IT WILL, it will have to be so absolute and so devastating that we will never again be attacked like this. "I long for our lives to be back where they were two days ago; I guess we had become complacent. I wonder if we will ever again be able to just pack our bags and "GO" wherever we wish and whenever we wish. "This country and the world have rallied to the support of NY and Washington so beautifully. I know that everyone, not only NY residents, is feeling this as much as we, here in NY, are. It doesn't matter how far away you are, every American feels so violated! "Here in Long Island, we're so used to hearing planes go over every 10 minutes or so. The silence now is eerie. Every morning, though, at around 7:30, a huge plane can be heard coming into NY. I am assuming it's military personnel or government people here to assess the situation. Every house has a flag flying. The street at the end of my block has a flag on every lamppost. My son heard God Bless America being played by a reporter, and he cried. Maybe now people will salute the flag as it passes in a parade, and clap for the veterans as they pass by. "I don't know; I'm rambling. Thanks for your shoulder, Howie, I know that you and all of our classmates are just sick at heart, as we were all raised here in NY. It doesn't really matter if you're living here or there or anywhere, our lives as we knew them last week are over, and a new distrust and a horrible sadness has set in. I don't think I've laughed in three days." Thanks, Nancy, for sharing those intimate thoughts with us. "I write, I call, I cry. I question, I speculate, I fear, I listen, I watch. I light candles, I sing, I give, I pray. I have never been so uncertain, so angry, so proud." 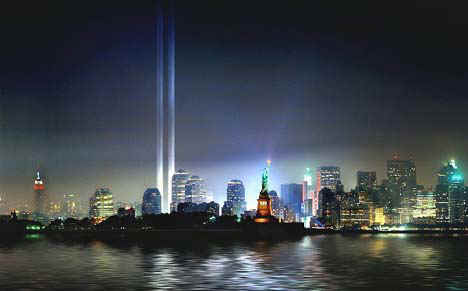 "The terrorist attacks Sept. 11 changed the world in myriad ways large and small. One of the small ways is this: Americans who once viewed New Yorkers as arrogant and self-absorbed now see them as big-hearted and heroic. These days the Big Apple is the apple of our eye." "When you are not in New York, you are out of town." Business, family or hating the cold did not take New York out of me. I know that "THE END" means Montauk. Because they are all American food to me. Because they were New Yorkers. Thank you, Vincent Pasquale, for sharing this with your fellow New Yorkers all over the world. Our own Oceanside volunteer firefighters assisted in the rescue efforts at the World Trade Center beginning on the very afternoon following the hateful attacks. Click here to view the spectacular "Ground Zero" photos taken by our hometown heroes. Finally someone says it right !!! You probably missed it in the rush of news last week, but there was actually a report that someone in Pakistan had published in a newspaper an offer of a reward to anyone who killed an American, any American. An American is generous. Americans have helped out just about every other nation in the world in their time of need. When Afghanistan was overrun by the Soviet army 20 years ago, Americans came with arms and supplies to enable the people to win back their country. As of the morning of September 11, 2001, Americans had given more than any other nation to the poor in Afghanistan. Americans welcome the best, the best products, the best books, the best music, the best food, the best athletes. But they also welcome the least. The national symbol of America, The Statue of Liberty, welcomes your tired and your poor, the wretched refuse of your teeming shores, the homeless, tempest tossed. These in fact are the people who built America. Some of them were working in the Twin Towers the morning of September 11, 2001, earning a better life for their families. I've been told that the World Trade Center victims were from at least 30 other countries, cultures, and first languages, including those that aided and abetted the terrorists. So you can try to kill an American if you must. Hitler did. So did General Tojo, and Stalin, and Mao Tse-Tung, and every bloodthirsty tyrant in the history of the world. But, in doing so you would just be killing yourself. Because Americans are not a particular people from a particular place. They are the embodiment of the human spirit of freedom. Everyone who holds to that spirit, everywhere, is an American. I know we all still feel the loss, and we continue to honor the brave rescuers and survivors, the memories of the fallen, and their bereaved families. God bless America – and God bless all of us. Use your BACK button to return to wherever you were. Copyright © 2001-2002 by Howard B. Levy and 1960 Sailors Association Inc. All rights reserved.